The chef-driven menu features the very best our region has to offer and features seasonal, sustainable products whenever possible. Chef Jessica is always on the hunt for America’s truly great foods, such as Berkshire pork, artisanal Gorgonzola, and grass-fed beef. Her menu ranges from fun, whimsical dishes to approachable, familiar dishes. Finally, in always keeping our guest’s needs at the top of our minds, we offer healthy, creative dishes including gluten-free and vegetarian options. *The Culinary team at Altius is pleased to offer you seasonally inspired dishes. 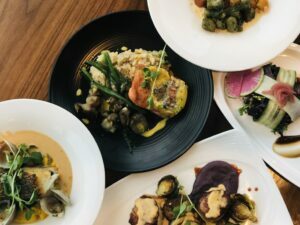 As part of Altius’s commitment to environmental stewardship, this menu contains locally sourced, organic, or sustainable items wherever possible. All cuisine is prepared without artificial trans fat. *The consumption of raw or undercooked meat, poultry, seafood, shellfish and/or eggs may increase the risk of food borne illness. A gratuity of 20% will be added to parties of 5 or more.